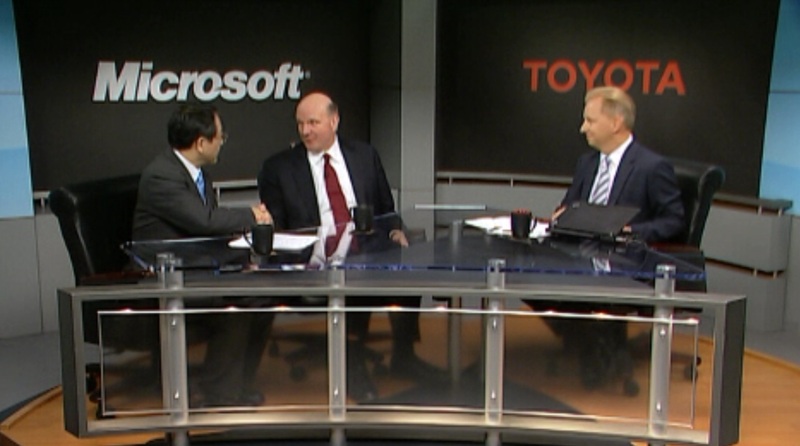 In a joint Webcast today, Toyota President Akio Toyoda and Microsoft CEO Steve Ballmer announced a strategic partnership between the two companies to build “a global platform for Toyota’s next-generation telematics services using the Windows Azure cloud computing platform. Telematics, by the way, is a new buzzword for the integration of information technology into vehicles including GPS, multimedia, and energy management. The two companies plan to spend $12 million (1 billion yen) to develop the new cloud platform, which will be integrated into some of Toyota’s electric and hybrid vehicles in 2012. The platform will allow users to use smartphones or computers to connect to and monitor their car from anywhere. For example, you could turn on your air conditioning or heat remotely, check your battery power, learn about maintenance information, or charge your vehicle at times when the power is cheaper and more available (which will hopefully be possible using the smart power grid of the future). Microsoft and Toyota hope to have a global cloud platform finished by 2015. The Azure platform currently has no relation to InTune, the Microsoft Sync-like service that Toyota announced at CES.